Need a Mortgage Loan to build or buy a home? Already have an NCCU mortgage and need a vehicle, home furnishings and appliances? Need a Home Repair Loan? 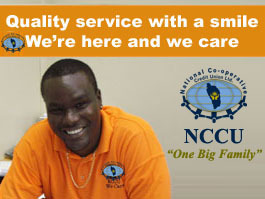 Have a mortgage at another financial institution and wish to switch to NCCU? First-time homeowners receive income tax relief of up to EC $25,000 annually on mortgage interest payments. Apply for a Line of Credit for having "Money When You Need It!" Visit ANY NCCU Branch to apply for your Mortgage Blast Loan. Resident Members: a minimum of 5% of the loan request in his/her Security Savings (we can work with you to meet this requirement). Employed persons: Most recent pay-slip or salary statement from your employer. Self-employed persons: recent financial statements of business. Details of your liabilities and commitments (loans, hire purchase, household expenses). If the approved loan is $77,000 and more or if you are 50 years and older, a medical examination by an approved medical doctor is necessary for loan protection coverage. Copy of the Certificate of Title (or a copy) of the property upon which the building will be constructed. Detailed Bills of Quantities (cost estimates) prepared by a qualifed appraiser, acceptable to NCCU, no more than six (6) months before the date of the loan. Letter from the owner or vendor stating intent to sell the property and the selling price. Copy of the registered Certificate of Title for the property to be purchased. A recent valuation of the property prepared by an appraiser, acceptable to NCCU, no more than 12 months before the date of the loan application. Current Market Valuation of the Property. If the purchased property is to be improved, additional documentation is required. For further details and requirements for applying for a loan while residing overseas click here! Is your land surveyed and registered? Are water, lights, and telephone services available? Meet with an NCCU loans Officer to find out how much you can afford to borrow. Have some idea of the space, number and size of rooms, number of floors, future needs. Contract to have your house plans drawn - an architect for a full service or a draughtsman for drawing services. Have your plans approved by the Physical Planning Division. Have a quantity surveyor extract Bills of Quantities (cost estimates). Decide if you need a full or labour contract. Tender for a contractor. Ask for references and check them. Select a contractor. Ensure the contract specifies the quality of materials to be used. A loan for building is disbursed in phases. Before each disbursement, an NCCU approved appraiser must complete a physical inspection of the site. If difficulty is experienced in reaching the required stage of construction for which funds have been disbursed, the member should contact NCCU immediately. Material deviations from the approved plan will require further approval from NCCU and the Physical Planning Division. The member will be required to request four (4) inspections from the Physical Planning Division.